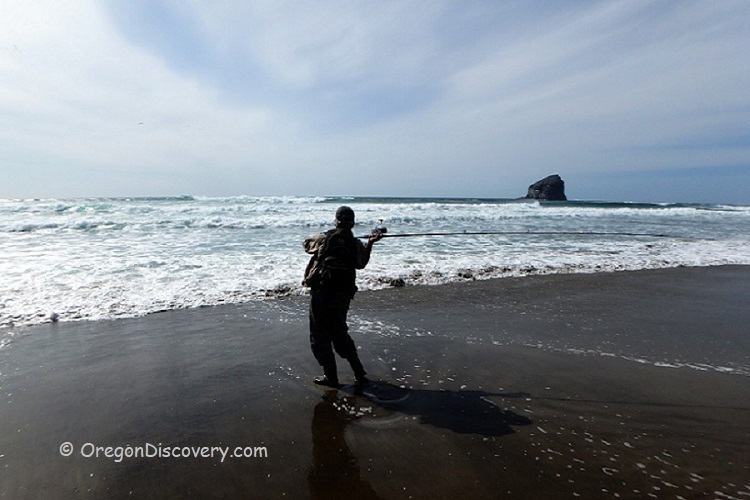 According to Oregon Department of Fish and Wildlife, seashore surfperch fishing in Oregon is one of the most underutilized fisheries in the area. This slim saucer-shaped fish that can reach up to 2 pounds is the most abundant and popular target for the surf angler. The fact that there are over nine dissimilar species of these fish on the Oregon Coast and plenty of fish within an easy cast from the shore makes this fish an easy target for most people. Are you interested in fishing but you're not aware of the best fishing season? Surfperch is available for fishing all year-round, the most fruitful time to fish is in the early summer and the spring. This is simply because during spring and early summer is when these fish school up along sandy shores for spawning. Do you know where to get the best fish? Best surfperch fishing occurs on an incoming tide mostly an hour or two before a high tide. To scout the best surfperch water, you should take advantage of low tides and look for places where there is depression or deep hole that could hold these fish. Some of such places are rocky areas in the sand, sandy places near jetties, places where the shore cuts inwards or in steeply sloped shores where the waves break hard. If you identify changes in the waves or areas where two surfs clash together, that's a good indicator of a good fishing spot. This is because such riptides dislodge baits and other sand crabs hunted by perch making the area surfperch rich. A calm area in the waves indicates a pocket or hole in the sand structure. Another indicator of a good fishing spot is the presence of troughs - long dips in the sand that are parallel to the shore. These are known to be highways or paths that the surfperch uses to move between the pockets. Do you know the perfect time to head out fishing? First, you need to identify when high tide and low tide appears. Once you know this, 2 hours before high tide is a perfect time to head into the waters. You can also fish a number of hours into outgoing tide until the bite dies. Seashore surfperch seashore fishing in Oregon requires you to master the right fishing tricks. Once you indicate and identify any surfperch rich area, lower your weight to the bottom and drag your rig to the hot spot. Once you get to the trough or pocket, you pause and maintain a smooth line tension. This way, you are enticing a bite by letting your bait drift just in front of their faces. You can also practice the technique of a steady retrieve by crawling your rig over a couple of pockets and troughs to cover more water. If you fail to identify any indicators while carrying out surfperch seashore fishing in Oregon, don't go home. Cast your weight past the first and second wave breaker while you are moving along the beach. Remember to keep moving since these fish are always on the move! Don't stay rooted as this lowers your chances of locating more fish. Do you have the best fishing equipment? Most species of surfperch such as rod and reel fishing require heavy tackling. A starter outfit for these fish includes a 9-11 foot long rod that is capable of handling a 2-6 ounce weight fish. It also includes a spinning reel that is large enough to hold 200-300 yards of 15 to 30-pound monofilament line. Do you have a fishing license? If you don't want to be bothered by the Oregon Department of Fishing and Wildlife, you need to get a general Oregon Angling License. This will keep you at peace since you won't face any distractions. Abiding by the laws and regulations is important if you want to become good at what you do. Always pick your spot, wear safe chest waders and never at any time turn your back on the ocean. Sneaker wavesSneaker waves might come in and sweep you into the surf without your knowledge making it hard for you to swim. In addition, always carry a bucket of water to keep your fish in as you catch them. Enjoy fishing and get the most out of it by mastering the most valuable tips and techniques for fishing surfperch. Surfperch seashore fishing in Oregon is easy and fun especially when one has mastered the best fishing tips and is well prepared with the right fishing equipment.